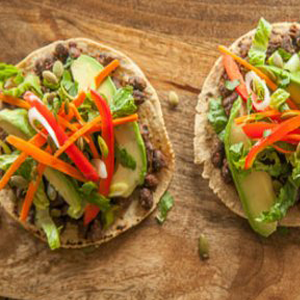 Make a small batch of quick-pickled vegetables for these tasty tostadas. If you don’t have white wine vinegar, use cider or red wine vinegar instead. Place carrot, pepper, green onions and vinegar in a medium bowl and let marinate about 1 hour. Drain vegetables and return to the bowl. Meanwhile, preheat the oven to 400°F. Place tortillas on 2 sheet pans and bake 5 minutes; flip and bake until tortillas just become crisp and begin to brown around edges, about 5 minutes more. Stir beans and chili powder together, and spread evenly over tortillas. Top with pickled vegetables, lettuce, avocado, cilantro and pumpkin seeds, and then serve. 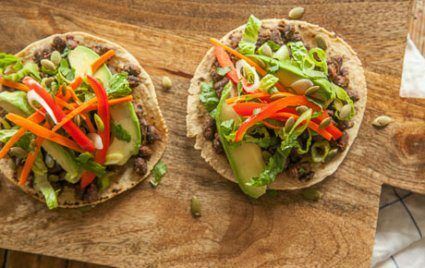 Per Serving: Serving size: 2 tostadas, 230 calories (45 from fat), 5g total fat, 0.5g saturated fat, 40mg sodium, 40g carbohydrates, (10 g dietary fiber, 3g sugar), 8g protein.